Last week, Panic Button unleashed hell on the Switch by releasing a new update for its 2017 title, DOOM. The developer said patch 1.2 improved the game's performance and allowed players to add recent competitors to their friend list. It also added in a video capture option, enabling the most brutal moments in the game to be recorded. The team at Digital Foundry was already impressed with Panic Button's efforts, despite the comprises, so how does DOOM on the Switch hold up now after this recent update? It's a slight improvement. During tests, DF found version 1.2 had a resolution of 1080x720 compared to the previous patch running at 1080x684. In terms of performance, there hasn't been a huge increase, but there's is a slight margin of difference - with the frame rate now closer to 30fps on average. Unfortunately, there's still a dip in when there are a lot of enemies on-screen. On the portable front, there's not much of a change and frame-pacing issues resulting in spikes are still present. To get the full rundown, view the above video. Have you played DOOM on the Switch since it was updated? What do you think about its performance? Leave a comment below. It's awesome that the developer keeps on updating this great game. I know it's not for everyone given its gore and delicate setting (for religious reasons) but as a game, it's very fun. I wonder how many until have been sold so far. Is it a success story? Doubt they're going to get much more out of it at this point. It seems like they've probably already optimized it to the max. I'm more interested to see how Doom Eternal will run! @Dahn_, I've not read any articles with released sales numbers but I have read that Doom did really good on Switch and it was another success story for Bethesda which is great it is a fantastic title and it looks and plays great on the Switch, I've had a great time with it. Plus Doom Eternal is coming to the Switch and getting released at the same time as the XBONE and PS4 versions which tells me Doom was definitely a success on Switch. The update hit on the 25th anniversary of the original game, if I'm not mistaken. I was excited to hear about the patch on NL, so I fired the game up, and noticed zero discernible difference. Still a great port, but the patch was much ado about nothing. Who wants to play DOOM by some no-name, trash teams like Bethesda and Panic Button now that there is finally an amazing port of Ark: Survival Evolved on our beloved Nintendo hybrid? Let's just hope it's sequel has 60FPS on Switch. @Shade_Koopa, I can guarantee you that will not happen and I would be very very surprised if that would even happen on XBONE or PS4 ., Personally 60FPS is great and yada yada but 30FPS is far far from being playable I wouldn't even notice or think about it other than reading about it in an article. @Shade_Koopa I very much doubt it. @LUIGITORNADO @Romeo-75 oh I know it's a slim chance. But hey, I can dream, can't I? Now get them to bring over the older Wolfenstein New order w/ expansion. Wolf 2 might be a more advanced game, but the older ones should run better on Switch and to be honest, New Order and Old blood is much better games than Wolf 2. It's my go-to game ok Switch, between Smash games. @JHDK Like others said. I hope you were being sarcastic. Great game and the switch version was made with a lot of love and effort. When I finish starlink I will return for a play through. It is worth it!! Will have to pop into a shop come next year for it. There's some aspects of modern gaming that irk me but when devs keep patching like this or adding content much later it is a very big plus and reninds me of older PC gaming in a good way. Honestly I’ve been gaming a long time and blasting demons on Switch is an unbelievable experience. Yes it runs at ~30FPS but to me it’s make no difference. The game is very well polished and the gyro just adds that little bit of precision needed. Love it. Love panic button. "What do you think about its performance?" @Jeronan Isn't it obvious? ARK is SUCH A TERRIBLE port. One of the worst things one can play on Switch. @RasandeRose Bethesda have already said that isn't happening. The engine doesn't scale anywhere near as well and would be a much bigger task to bring to the Switch. No, that was a comment to Fallout 3. Id tech 5 should be easy to port as its basically tech 6 but with no dynamic lighting and scaled back effects. @RasandeRose they said all older games. I haven't played it on the Switch yet, but I've thought about getting it. @diwdiws, Yes it does, but according to DF and Tech Times it also dips below 60FPS frequently on PS4 and XBONE ., It's not at a solid 60FPS the whole game through. great.. but my question remains unanswered. will this fix the bug that halts the player from 100%ing the game? @BrettAwesome, I can honestly say I don't notice a big difference. I've played Doom on PS4 and I've played it on Switch and I really don't notice the difference, the only way I notice anything is if I really don't pay attention to the gameplay and look for it which I fail to see the point of that. 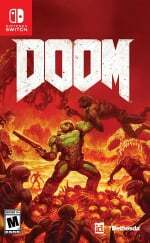 Doom on Switch : $80. Well, I'd love to play it on my Switch, but holy jumping mother o' god in a side-car with chocolate jimmies and a lobster bib!, that price is insane. It's all awesome that a team is supporting their game like this post release, but man.... this isn't worth an additionnal $60 just for that. Good to see them still trying to optimize it further, thumbs up! Unfortunately this game is not my cup of tea, just too much chaos. Panic Button is really earning my respect with the effort they are putting into all their ports, few companies care this much to keep fine tuning them. @Shade_Koopa You know there is a strict no dreaming policy on the internet. We all signed the same document. Doom 2016 was a port to a fully x86 intended game, so it's pretty amazing for what it is. Doom Eternal should be really impressive since it's being designed with Switch as a primary. .....But I've cancelled my preorder since after the fiasco of Fallout '76 it's going to be a long, long time before I buy a Bethesda game again. They need to reinvent their company and policies first. Maybe TES6 in 2037 will lure me in. This game was so great on Switch and in general. Love that they are still trying to optimize it so long after release with patches and gyro support etc., but I'm pumped for DOOM Eternal now. I will go back and play through this again soon! @NEStalgia Was saying the same thing - until someone at work was like "Bethesda publishes the Doom games, but they are made and developed by ID", so I guess I will day 1 this. @Dang69 Bethesda has owned id since 2009. Edit: And, notably, Carmack left id shortly after, in 2013. .
@NEStalgia Zenimax owns all those companies, BUT ID functions as their own studio and Bethesda just publishes Doom. It's like Nintendo publishing a Xenoblade game, they own it but they didn't develop it "themselves". Actually that's prob a little different there, cuz "majority stock holder" vs "outright own". @Dang69 Sort of yes, sort of no. It's more complicated than that. The disastrous Bethesda engine that has made a mockery of Fallout (and TES) is because they're fixed on the ancient Gamebryo engine. It was always bad. However they forked off Gamebryo and stuck id with continuously modifying it, trying to to make it modern. So there's more top-down control applied over id than what it seems, though it's still quasi-independent as in, it's still in Austin and does a little of it's own thing. Zenimax proper actually makes better games than Bethesda Game Studio....TES: Online is significantly better put together than Skyrim and the Fallouts...Zenimax proper makes that themselves in their own engine. But the nasty business tactics of the crown store are now bleeding between MMO Zenimax and Bethesda Game Studios' Fallout...so if they're intermixing things at that level, I'm not sure how extensive the top-level control of id is going these days. A truly astonishing technical achievement. As impressive as anything I’ve seen in the last few years. @Romeo-75 I'm not one to get hung up on FPS and the like, but the difference between 60fps on PS4 and up to 30fps on the Switch is immediately apparent. That said, I can play on my commute with the Switch so I love it. Kudos to Panic Button's continued commitment and support. When a developer revisits that tells you something. It means they know they have interested gamers and parties that will continue to invest in their games. And that's how you keep yourself in the gaming market.